College Liftoff is growing…but we’re growing with a purpose. The fallout of improper college planning is making headlines all around us. Student loan debt is in the trillions. Graduates are being met with underemployment. And young people making less money than previous generations. But most don’t even realize that the lack of appropriate college planning is behind all of these problems. College Liftoff exists to change this narrative and provide the solution. We ARE the solution. And we’re growing to provide that solution. We’ve recently added a new Community Relations Advocate to our team to help spread the word and educate people where they are about making smarter college decisions. Michael Hedrick has lived through it–his own personal journey has led him to feel called to provide the solution to this crisis. College Liftoff Community Relations Advocate Michael Hedrick. My name is Michael Hedrick, I am 27 years old, and I reside from little ol’ Mount Vernon, Ohio. I am excited to come on as the newest team member to the College Liftoff team and all the wonderful things we are doing to serve high schoolers and their families to navigate the difficult, and often expensive, journey through college on the way to a fulfilling career. I would like to share my story, as it is unique, and some might view as completely unexpected for me to end up at a place like College Liftoff. But for anyone who knows me, knows that my faith is very important to me, and so to me it is no coincidence that I ended up at College Liftoff, where I believe God has placed me. It was the fall of 2009 that saw my high school journey quickly coming to an end with college creeping closer into sight. Despite my passion for baseball and the dreams to play professionally one day, I came to accept that baseball would likely not be become my career, and thus I started thinking about my collegiate pathway. I went to a small, private university (Olivet Nazarene University) where I started off as an engineering major, because that is what my aptitude tests and math teacher told me I would be good at, and with a father as a computer engineer it just seemed to be the logical decision. That was short-lived, however, as I quickly found out that engineering was not for me, and I found myself changing my major to Exercise Science that first semester, deciding to pursue the long journey of physical therapy. That first semester also saw another chapter ending, stepping away from collegiate baseball, as my new class schedule and career pursuit would not be compatible. I have always considered myself a hard worker, and so working a few part time jobs during college seemed only natural to me in order to help minimize the already expensive cost of college. I worked as a resident assistant for 2 years to help minimize the cost of room and board, and also worked for one year in a physical therapy clinic. However, the job I enjoyed most, and the one that had the biggest impact on my life, was working as a student ambassador for Alumni Relations. Even though it seemed to have little to do with my major or career pursuits, it actually had the most impact on my personal growth, giving me life-long skills that brought me to where I am today. Those who knew me before college can testify that I was very shy, deathly afraid of public speaking, and was a prime example of an introvert. My time as a student ambassador taught me so much about myself and brought me out of my comfort zone, as my job consisted of interacting with individuals, and on occasion giving speeches. Looking back now, it was this job that sparked my love for connecting with people and taught me invaluable skills in preparation for physical therapy, and ultimately for my work at College Liftoff as well. Fast forward to May of 2017, and I was graduating from The Ohio State University with my Doctorate of Physical Therapy degree, and quickly starting my first full-time job at Riverside Methodist Hospital. However, it wasn’t until this time that I really started to sit down and think about the financial ramifications that were soon coming to fruition in the form of student loan debt. My wife, Tessa, and I had only been married for seven months when I graduated, and I was about to multiple our debt situation by nearly 7-fold, putting us well into 6-figure debt! As I finally saw the extent and reality of our situation, I got scared to say the least, thinking we would never be debt-free and able to buy a house or help our kids go to school. It was during the 6 months grace period after graduation that I took it upon myself to learn about personal finance and how Tessa and I could clean up this mess so that we could finally build wealth and not feel chained down by student loan payments for the rest of our lives. The search for money management principles lead me to Dave Ramsey, and shortly thereafter we went through his Financial Peace University class, and we are well on our way to becoming debt free, SO THAT we can change our “family tree”. Because what I found is that debt hinders our ability to use our greatest wealth building tool, our income. We want to ensure we can invest in our future and the future of our generations to come! We had found our “WHY”! This led me to continue learning and applying these financial principles, and instilled in me a specific passion for high school/college/newly wed age groups. This new-found passion found its way into conversations at work on several occasions, which also led to a colleague telling me about their experience with College Liftoff. Through our conversation, I was immediately intrigued by the services they provided to high schoolers and their parents. That colleague encouraged me to reach out to Aaron, the CEO and founder of College Liftoff, to see if they could use a part time associate. 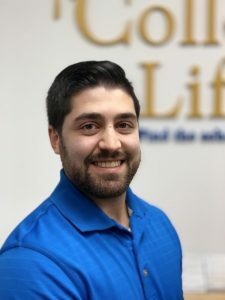 My initial thought was, “What would he want with a physical therapist?” But I decided to reach out anyway; if nothing else, I could better understand the services provided through College Liftoff, and spread the word of what they could do for students – since at the time I was leading my first Financial Peace University class. And a couple months later, here I find myself working in a capacity I would never have foreseen a couple of years ago. I wish I had had a service like College Liftoff to prepare me for college, as I would have saved thousands of dollars to say the least. But that is why I am here, to help others along their journey, and to help others understand the value for which they are investing, so that they can hopefully avoid the crippling mountain of debt we now find ourselves working hard to overcome. I am very excited to come alongside a great group of individuals, who are helping to serve a population I am very passionate about – helping students and families responsibly navigate and use college as a resource on the path to their career.